Leif Karlstrom’s dad is an earth sciences professor who studies the American Southwest. His mom is a violinist with the Santa Fe Symphony. Exposed to both professions growing up, Karlstrom had no intention of following the career path of either parent. Turns out, he followed both. By day, Karlstrom is a member of UO’s earth sciences faculty, a specialist in volcanology. He researches the source of eruptions and the way fluids flow, such as why magma either oozes or blasts from a volcano, what governs the recurrence of eruptions through time, and how noise made by volcanoes can be used to probe their unseen inner structure. By night, he’s a violinist. Classically trained, he’s played in everything from punk bands to orchestras. 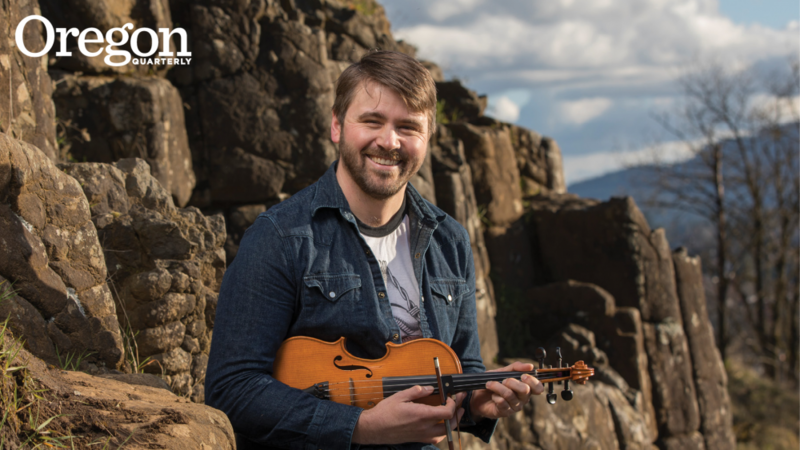 While attending graduate school in the Bay Area, Karlstrom helped form a bluegrass group that won the RockyGrass and Telluride music festival competitions, and he has toured Europe and Asia. He still gigs often, including a show last New Year’s Eve at the historic Jefferson Theater in Charlottesville, Virginia. Where most people would see little overlap between science and music, he likens the mental agility needed to connect clues about the Earth’s history to that of interpreting a complex musical composition. Karlstrom was an undergraduate in the Clark Honors College, attracted by the university’s strong music and science programs and the nearby wilderness. He earned a degree in physics—his thesis drew analogies between how flocks of birds interact and how groups of musicians match pitch with each other. He also majored in violin performance, studying under the UO’s virtuoso Fritz Gearhart, who taught him techniques that he continues to use. He was only a few credits shy of a math major, so he earned that one, too. But three degrees—all earned in 2006—was as difficult as it sounds. “I think if it came easy to me, I would have quit,” he says. A recent paper from Karlstrom and former UO doctoral student Joseph Byrnes has been impactful—perhaps because it’s about a six-mile-wide meteorite smashing into the Earth 66 million years ago. Scientists have long debated whether a meteorite or cataclysmic eruptions wiped out most life on the planet, including non-avian dinosaurs. Byrnes and Karlstrom theorize that the meteorite’s violent blow near Mexico triggered volcanic activity at ridges that underlie all of the Earth’s oceans. This hypothesis is a new wrinkle in a decades-old debate.